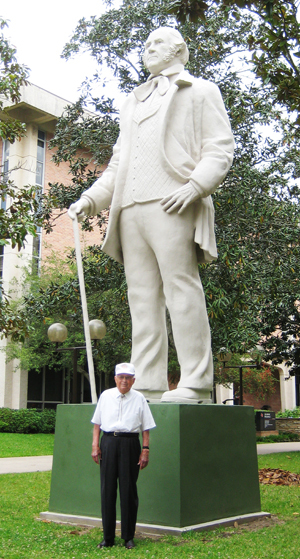 M. B. Etheredge stands beside Sam Houston statue. One old soldier got his first look at a new statue of an even older one this week. 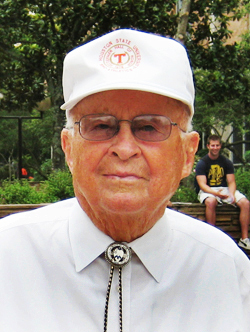 M. B. Etheredge, this country's highest decorated surviving soldier of World War II, came to the Sam Houston State University campus to see the new statue of General Sam Houston. The statue is a gift from SHSU alum Ron Mafrige. It is 20 feet tall, on a four-foot base, and stands near the Lowman Student Center and Smith-Hutson Building. Mafrige funded the statue with a $40,000 donation. He said he wanted to do so to honor both Etheredge and the statue's sculptor, David Adickes, neither of whom he feels is appreciated as they should be. Etheredge was impressed, and reflective. "I'm quite flattered," he said. While looking at the statue, Etheredge did have a few thoughts about General Sam as a leader, and remembered some of his own experiences along those lines. "He was quite a soldier," Etheredge said of the man who led the Texas fight for independence. "He didn't scare." Which brought to his mind an exchange he had with one of the soldiers in his company, which had been through some of the fiercest fighting in World War II after they invaded Italy in January 1944. "C. O. (commanding officer)," the soldier said. "You haven't got a nerve in your body." "I'm just as scared as you are," Etheredge told him. "What would you do if I'd run?" "I'd run too," the soldier told him. 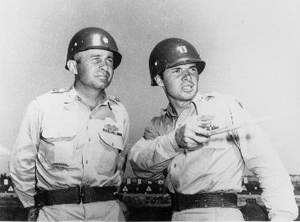 M. B. Etheredge, left, and Audie Murphy. Murphy was the most decorated U. S. combat soldier of World War II, and Etheredge was second. They were in the same combat unit and later in the Texas National Guard in 1951, when this photo was taken. Murphy died in 1971. Although he was a track star at Sam Houston State, in the U. S. Army Etheredge did his running toward enemy positions. He earned three Silver Stars, two Bronze Stars, and two Purple Hearts for gallantry in action. Etheredge, now almost 93, is a 1937 graduate of Sam Houston State Teachers College. He was working as a young superintendent of schools in Brazoria County when he heard about Pearl Harbor and decided to enlist. He was an obvious leader and rose quickly in rank through promotions in training and in battle in North Africa, Italy, and France. In May of 1944, in one four-hour battle, his company of 186 men and six officers was reduced to just 37 men and Etheredge as the only officer. When they got to Rome, Etheredge said this week, the officer who promoted him took off his gold bar of a second lieutenant and pinned on the silver bars of a captain, without his ever having worn the silver bar of a first lieutenant. He later rose to the rank of lieutenant colonel. Mafrige said he sat with Etheredge during a Sam Houston State basketball game this season, had met him at several SHSU functions, and also read a book about him. "I read his book, From Huntsville to Hell," Mafrige said of Etheredge. "What he went through in World War II was very impressive, and I don't feel like his exploits have been sufficiently honored." He said he also has high regard for renowned large media sculptor and SHSU alum David Adickes, who created the 67-foot statue of Sam Houston that stands on I45 south of Huntsville. The statue on campus is a replica of the one Adickes created for General Sam Houston's 200th birthday anniversary, and named "A Tribute To Courage." Many people simply call it "Big Sam," and it is promoted as the "World's Tallest Statue of an American Hero." "I honestly believe there will be a time when David Adickes will get his just due as a sculptor," said Mafrige, who has made a number of contributions to SHSU that total more than $2 million. After World War II, Etheredge taught for 33 years at Sam Houston State and served three terms in the Texas Legislature. In 2003 he was awarded the Texas Medal of Honor.